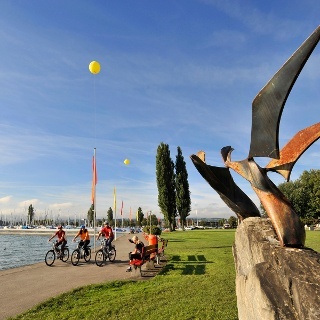 Heart Route – stage 13: Altstätten-Rorschach • Bicycle Ride » Bodensee! 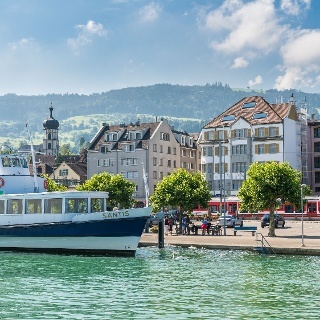 The Herzroute (Heart Route) that criss-crosses all of Switzerland ends in the St.Gallen-Lake Constance region – a region with countless highlights and a big heart. 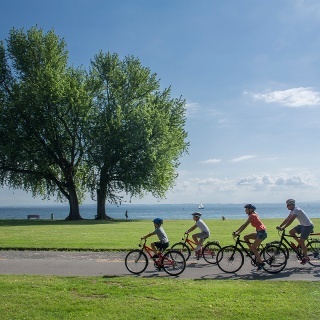 From west to east, from Lake Geneva to Lake Constance – the entire distance by bike: the Herzroute, or Heart Route, aims to acquaint tourists with Switzerland as a paradise for biking. The last stage begins in the romantic wine-growing town of Altstätten. But you’re going to have to pedal hard to get here. But once you make it, high above on the 1,100 metre high St.Anton mountain, cyclists have a spectacular view of the St.Gallen Rhine Valley. Now the journey continues down to Walzenhausen. 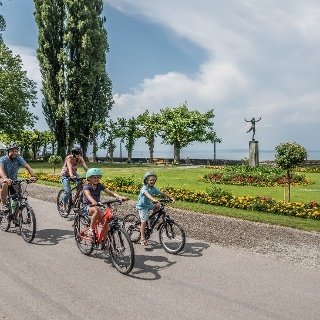 The view is still fantastic on the way down, just the landscape is different: instead of the Rhine Valley, cyclists have a spectacular view of Lake Constance, Germany and Austria. And soon of the historic Kornhaus, or granary, Rorschach's landmark. This is where the Herzroute ends in the pretty little harbour town in the southernmost bay of Lake Constance. 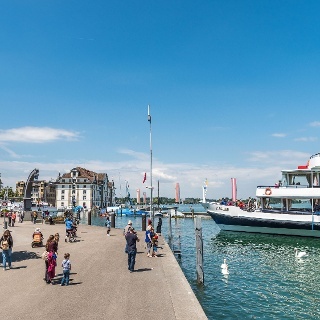 But this doesn’t mean that your stay in the St.Gallen-Lake Constance region should also come to an end. With its historic wooden bathhouse and enormous sand sculptures, Rorschach enchants tourists and locals alike every year. 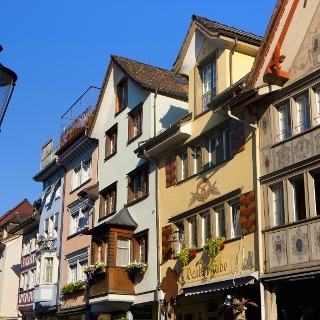 The nearby UNESCO World Cultural Heritage city of St.Gallen – the capital of Eastern Switzerland – with its world-famous Abbey Library and Baroque cathedral is also worth a visit. 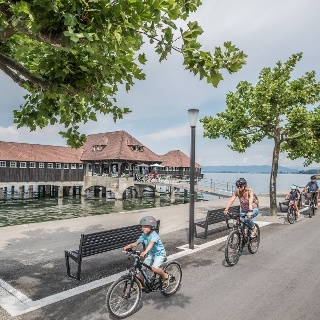 The old bathhouse built in 1924 is the only remaining building of its kind on the Swiss side of Lake Constance. A swim is a refreshing way to end the tour! From St.Gallen in the direction of Teufen, section of “Grand Tour of Switzerland” to Gais via Stoos to Altstätten. The city of Altstätten is divided into several parking zones. Parking is free of charge at the Stossplatz and the GESA sports centre, Tennishalle and Grüntal (football field).